Want to know how many nutrients are in your late-afternoon snack? My Fitness Pal allows you to save particulars according to meal or food combinations. How can My Fitness Pal‘s tracking app for iPhone and Android help when it comes to keeping those important resolutions for health and fitness, especially in our busy lives? In a word: Simply. In a second: Intuitively. And that’s important, especially when it comes to not having the time typically it takes to learn new software, let alone making the time to track nutritional and fitness information. Thankfully, My Fitness Pal is quick and easy to use, especially on smart phones. What’s more, it’s not only also available for your PC, it’s free–and you just can’t beat that kind of reliability and ease of use at no cost. As a recipe developer and health site owner, I not only keep track of how I’m eating for health and for weight management, I have the added responsibility of running the nutritional values on hundreds of recipes I have created for millions of families around the world. Thankfully, as soon as I became acquainted with My Fitness Pal on my Android, the process of calculating nutrients and recipe information became simple and intuitive, allowing me more time in the kitchen and less time crunching numbers over my calculator. Want more reasons I love My Fitness Pal’s app? Easy to change information. Want to focus on some nutrition values and nix others you don’t often use? Simply focus on the information you need. (I add in fiber, since it’s important for me calculate net carbohydrates along with total numbers). Lots of options allow me to shift my values within calories (I typically eat roughly 60% calories from fat, 30% calories from protein, and 10% calories from carbohydrates). 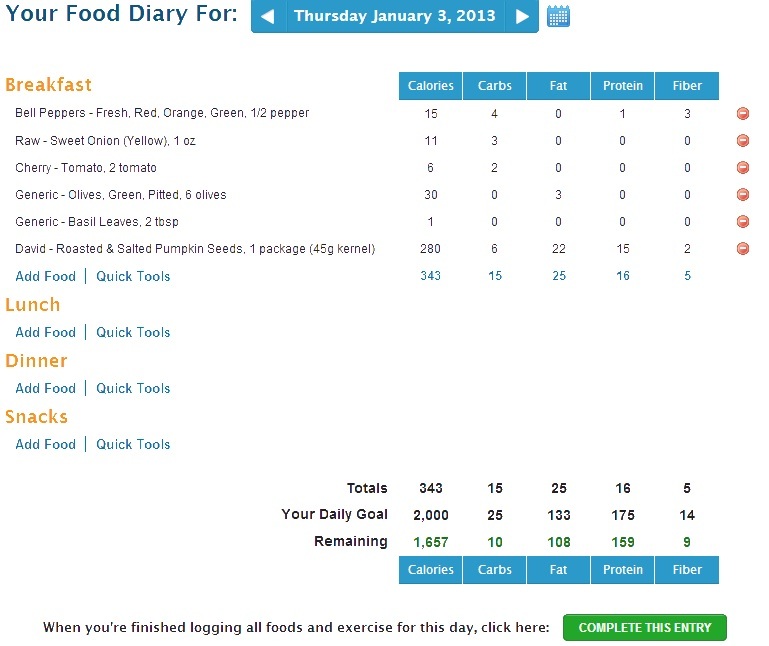 Want to change the number of calories or percentages, shoot for more (or less) protein daily? Less fat? More Vitamin D3? You can do that, too. Thousands of products listed. At first I was a bit overwhelmed at the number of options available. Used to less intuitive search engines in other programs, suddenly having so many products to choose from also means closer values to foods I am actually using, and not generalized numbers. Really, though, since a lady likes to accessorize, I quickly found myself maneuvering the different foods and types of foods with ease. Easy Menu Repetition. Want to save time? You can repeat often-enjoyed menus, especially when ingredients take time to list over and over. Meal Distinction. I appreciate the differentiation between meals for more options. I can focus on breakfast, lunch, dinner, snack and drink options with customizable, easy-to-use menus, and even keep track of the number of beverages I’m getting in a day. Brand names and generics for thousands of products (including restaurant menu items) make it really easy to log those specific foods. Fitness tracker. Exercise is only a dirty word if you’re playing in the garden. Keep track of your activity levels and reward your efforts. Public and Private Settings adjust your account to your comfort levels. (I typically keep mine private since I use the program also for tweaking and for recipe nutrition). Want to add friends and keep each other accountable? You can do that, too! A recipe is born. Save groups of ingredients and their nutritional values for quick-add recipes. I have to admit I was initially a borderline crabby skeptic at the prospect of having to learn new software, learn it on my Android, and use it for my daily needs, but if it’s one thing I learned, it’s that a minimal amount of playing with the software nets an invaluable resource I’m now relying on to keep me moving at the speed of eating light. I recommend this app wholeheartedly. Crisp, delicious Welch’s Light not only tastes great, but also helps you stay on track. With only 45 calories per serving and no added sugar, you’ll be sure to sip smarter with Welch’s Light! Try both Concord Grape and White Grape flavors: made with our very own grapes and full of antioxidant Vitamin C.
Where? I’ve never found a setting that lets me change from their crazy high-carb, low-fat plan. From there you can choose guided or unguided to change what you want to see. I’ve changed mine. I hope that helps! I was wondering the same thing! Thank you for that!! I would love to see your recipes listed on MFP!! I have made several and they have helped me stay on plan in weight management. Hi there! Because the hot mess that my numbers typically are since I input recipes into the main screens, and all over the place, I keep my account set to private. Otherwise, it would cause too much confusion. I’ve used this app for about a year. Starting after a fall off the wagon when I just couldn’t seem to get it going again. It was like magic. I love this app. The scanning of items is also a big plus. If something isn’t in the database, you can quickly enter in the values and save it for future use. Love this app! I do not like the new Atkins app! It was difficult and very limited. Hey there! I’d love to know what people think of this app compared to the Livestrong one that seems to do the same things. I’ve had the Livestrong app for years and can never keep with it, plus it doesn’t seem to provide me everything I like to track, such as total fiber consumption for the day, etc. Thanks so much! Hopefully someone will chime in. I’ve never used the other app you’re referencing. I tried that app and didn’t use it for long at all. Couldn’t find what I was looking for and if I remember right it was just too “busy”. Again, BACK to MyFitnessPal. I find that the data base is VERY extensive. And I add recipes all the time and save them so I can just add them to my meal. I used to use Livestrong, and its a great app, but I wanted quick carb breakdown, and it is not available there, so I switched. I also did the ideal protein diet, and their foods were already entered. Thanks guys! 🙂 So you can add recipes from the app? That’s something Livestrong fails on, and has been a big issue for me. I’ll have to give it a try! I too used to use the Livestrong app. I’d been using it for about a year. 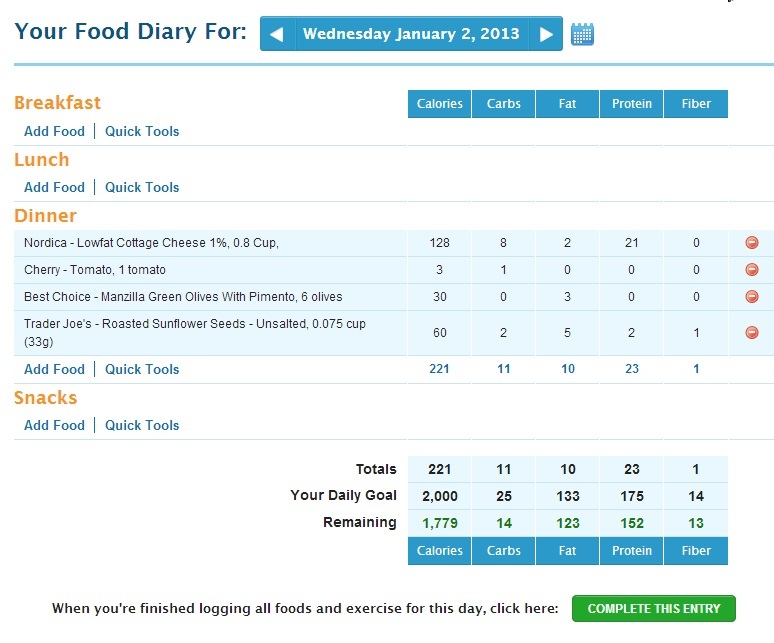 One of my complaints was that I couldn’t customize the food diary without paying for the ‘gold’ membership. My DIL told me that MFP could do those things for free, so I cautiously checked it out, while at the same time keeping using my livestrong app. After about a week, it was clear to me that MFP had just as large (if not larger) a food database, with more customization possibilities than I would have gotten with Livestrong Gold. By the second week I had switched and haven’t looked back in the least. So I was able to get my goals customized for the food…any suggestions on their “fitness/workout” part? It says I am going to gain weight, (well if that were true I would be 300 pounds by now eating this way)…do you just ignore that part? I totally ignore that part. Just curious, what percentages do you guys go with for the fat/carb/protein goals? I’d be curious where everyone else is coming from in that respect. I wouldn’t say I’m “on a low carb diet” but I’m very carb conscious and I’ve been cutting down on sugar (I’m insulin resistant), and I’m considering adopting some form of the Paleo diet. Hi, Tiffany! I stick to 30-35% of calories from protein, and I try to vary protein sources to keep it interesting. If you’re cutting back on sugar, be cautious with paleo, as it endorses the use of honey and maple syrups. I say stick to real-foods, lower-carb and you’re going to be great! I’m new to your blog and day 8 on Atkins. (I’ve lost 8 pounds) Today, I would kill for chocolate, I googled Atkins induction snack and found your site. I think I’ve found gold. But, the real purpose for this post was to comment on what you had for breakfast this day…. really? Pumpkin seeds, olives, peppers and onions for breakfast? Hi, Nanette! It is so nice to meet you! I am glad you found me. YES! I am a total silly girl when it comes to breakfast. I typically go right for the nuts, seeds, proteins and fats. I am a super-taster, so there are very few ways I enjoy eggs. It definitely makes me creative! Oh, and the reason I eat kind of weird stuff is because I am testing myself for food allergies through elimination, so that is limiting me right now while I figure these weirdo allergies/intolerances out. I mean really. Who is allergic to broccoli? ME! I’m just wondering about this site. Is fiber deductible? So I get net carbs if I remove them. I see there’s no net carb choice. Hi, Ida! Fiber is deductable. You adjust for that in your settings and fiber will show up as one of the options with the other main values. I think I shared how I did that in a comment in this thread. If not, please let me know! Do not deduct fibre if you are using in the UK. As fibre is already deducted on UK produces as I understand it, so carbs are net on our UK labelling. That is excellent information, Ade! Thanks so much! Amazing app! I couldn’t believe it was free. I’ve been dieting since the summer and wasn’t able to reach my goals. Once I started using this app, everything became much easier. With this app, you know exactly how much you’ve eaten. You also know the nutritional value of each item, which assists in picking healthy choices… Definitely a winner.